اتابکی, فریبرز, یوسفی, محمدحسن, آل کرم, ایمان. (1395). بررسی و بهبود رسانایی پلی(4،3- اتیلن دی اکسی تیوفن): پلی(استایرن سولفونیک اسید) ( PEDOT:PSS)با افزودن نانوذرات نقره و مایع یونی 2-متیل ایمیدازولیوم. نشریه شیمی و مهندسی شیمی ایران, 35(4), 39-48. فریبرز اتابکی; محمدحسن یوسفی; ایمان آل کرم. "بررسی و بهبود رسانایی پلی(4،3- اتیلن دی اکسی تیوفن): پلی(استایرن سولفونیک اسید) ( PEDOT:PSS)با افزودن نانوذرات نقره و مایع یونی 2-متیل ایمیدازولیوم". نشریه شیمی و مهندسی شیمی ایران, 35, 4, 1395, 39-48. اتابکی, فریبرز, یوسفی, محمدحسن, آل کرم, ایمان. (1395). 'بررسی و بهبود رسانایی پلی(4،3- اتیلن دی اکسی تیوفن): پلی(استایرن سولفونیک اسید) ( PEDOT:PSS)با افزودن نانوذرات نقره و مایع یونی 2-متیل ایمیدازولیوم', نشریه شیمی و مهندسی شیمی ایران, 35(4), pp. 39-48. اتابکی, فریبرز, یوسفی, محمدحسن, آل کرم, ایمان. بررسی و بهبود رسانایی پلی(4،3- اتیلن دی اکسی تیوفن): پلی(استایرن سولفونیک اسید) ( PEDOT:PSS)با افزودن نانوذرات نقره و مایع یونی 2-متیل ایمیدازولیوم. 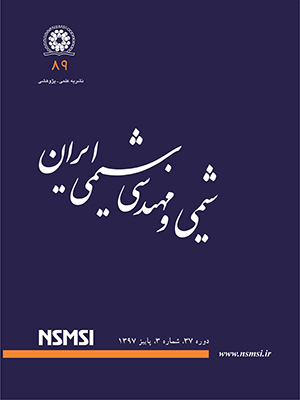 نشریه شیمی و مهندسی شیمی ایران, 1395; 35(4): 39-48. Kaiser A.B., Rogers S.A., Park Y.W., Charge Transport in Conducting Polymers: Polyacetylene Nanofires, Molecul. Crystal Liquid Crystal., 415: 115-124 (2004). Gusakov P.E., Andrianov A.V., Aleshin A.N., Matsushita S., Akagi K., Electrical and Optical Properties of Doped Helical Polyacetylene Graphite Films in Terahertz Frequency Range, Synth. Met., 162:1846-1851 (2012). Baeriswyl D., Campbell D.K., Clark G.C., Harbeke G., Kahol P.K., Kiess H., Mazumdar S., Mehring M., Rehwald W., “Conjugated Conducting Polymers”, Editor: Kiess H., Springer Science & Business Media (2012). Bakhshi A.K., Bhalla G., Electrically Conducting Polymers: Materials of the Twentyfist Century, J. Sci. Ind. Res., 63:715-728 (2004). Salzner U., Theoretical Investigation of Excited States of Large Polyene Cations as Model Systems for Lightly Doped Polyacetylene, J. Chem. Theor. Comput., 3: 219-231 (2007). Njuguna J., Pielichowski K., Recent Developments in Polyurethane-based Conducting Composites, J. Mater. Sci., 39: 4081-4094 (2004). Massoumi B., Omidi H., Vessaly E., Entezami A.A., Nanostructure Nanostructured Poly(2,2′-bithiophene)-co (3-dodecylthiophene): Preparation, Investigation of the Electroactivity, Conductivity, and Morphology, Int. J. Polym. Mater. Polym. Biomater., 63: 323-329 (2013). Massoumi B., Lesani H., Saraei M., Entezami A.A., Copolymerization of Pyrrole with N-Pentyl and N-Dodecylpyrrole: The Electroactivity, Conductivity and Morphology of Nanocopolymers in Relation to Monomeric Comosition, Iran. Polym. J., 20: 747-756 (2011). Shen J., Tsuchiya K., Ogino K., Synthesis and Characterization of Highly Fluorescent Derivatives Containing Polystyrene Sidearms, J. Polym. Sci., Part A: Polym. Chem., 46: 1003-1013 (2008). Cheylan S., Fraleoni-Morgera A., Puigdollers J., Voz C., Setti L., Alcubilla R., Badenes G., Study on a Thiophene-based Polymer for Optoelectronic Applications, Thin Solid Film., 497: 16-19 (2006). Cheylan S., Bolink H.J., Fraleoni-Morgera A., Puigdollers J., Voz C., Mencarelli I., Setti L., Alcubilla R., Badenes G., Improving the Effiiency of Light-Emitting Diode Based on a Thiophene Polymer Containing a Cyano Group, Org. Electron., 8: 641-647 (2007). Zou Y., Sang G., Wu W., Liu Y., Li Y.A., Polythiophene Derivative with Octyloxyl Triphenylamine-Vinylene Conjugated Side Chain: Synthesis and Its Applications in Field Effect Transistors and Polymer Solar Cell, Synth. Met., 159: 182-187 (2009). Niu L., Luo Y., Li Zh., A Highly Selective Chemical Gas Sensor Based on Functionalization of Multi-walled carbon Nanotubes with Poly(ethylene glycol), Sensor Actuator. B, 126: 361-367 (2007). Shadi L., Karimi M., Entezami A.A., safapindar K., A Facile Synthesis of Polyaniline/Polyethylene Glycol/Polyaniline Terpolymers: Preparation of Electrospun Conducting Nanofibers by Blending of the Terpolymers with Polycaprolactone, Polym. Bull., 1-17 (2014). Zhang, W., Zhao, B., He, Z., Zhao, X., Wang, H., Yang, S., Cao, Y. High-Efficiency ITO-Free Polymer Solar Cells Using Highly Conductive PEDOT: PSS/Surfactant Bilayer Transparent Anodes, Energy Environ Sci, 6: 1956-1964 (2013). S.-I. Na, S.-S. Kim, D.-Y. Kim, Efficient and Flexible Ito-Free Organic Solar Cells Using Highly Conductive Polymer Anodes, Adv. Mater., 20: 4061-4067 (2008). J.Y. Kim, J.H. Jung, D.E. Lee, J. Joo, Enhancement of Electrical Conductivity of Poly (3, 4-Ethylenedioxythiophene)/Poly (4-Styrenesulfonate) by a Change of Solvents, Synth. Met., 126: 311-316 (2002). Kim Y.H., Sachse C., Machala M.L., May, C., Müller‐Meskamp L., Leo K., Highly Conductive PEDOT: PSS Electrode with Optimized Solvent and thermal Post‐Treatment for ITO‐Free Organic Solar Cells, Adv. Funct. Mater., 21: 1076-1081 (2011). Nardes A.M., Janssen R.A.J., Kemerink M., A Morphological Model for the Solvent-Enhanced Conductivity of Pedot:pss Thin Films, Adv. Funct. Mater., 18: 865-873 (2008). Reyes-Reyes M., Cruz-Cruz I., López-Sandoval R., Enhancement of the Electrical Conductivity in PEDOT: PSS Films by the Addition of Dimethyl Sulfate, J. Phys. Chem. C, 114: 20220-20224 (2010). Ouyang J., Chu C.-W., Xu Q., Yang Y., High-conductivity poly(3,4-ethylenedioxythiophene):poly(Styrene Sulfonate) Film and its Application in Polymer Optoelectronic Devices, Adv. Funct. Mater., 15: 203-208 (2005). Wang T., Qi Y., Xu J., Hu X., Chen P., Effects of Poly(ethylene glycol) on Electrical Conductivity of Poly(3,4-ethylenedioxythiophene)–poly(styrenesulfonic Acid) Film, Appl. Surf. Sci., 250: 188-194 (2005). Crispin X., Marciniak S., Osikowicz W., Zotti G., Denier van der Gon A.W., Louwet F., Fahlman M., Groenendaal L., De Schryver F., Salaneck W.R., Conductivity, Morphology, Interfacial Chemistry, and Stability of Poly(3,4-Ethylene Dioxythiophene)–Poly(Syrene Sulfonate): a Photoelectron Spectroscopy Study, J. Polym. Sci. Polym. Phys., 41: 2561-2583 (2003). Fan B., Mei X., Ouyang J., Significant Conductivity Enhancement of Conductive Poly(3,4-Ethylenedioxythiophene):Poly(Styrenesulfonate) Films by Adding Anionic Surfactants Into Polymer Solution, Macromolecules, 41: 5971-5973 (2008). Ouyang J., Xu Q., Chu C.-W., Yang Y., Li G., Shinar J., On the Mechanism of Conductivity Enhancement in Poly(3,4-Ethylenedioxythiophene):Poly(Styrene Sulfonate) Film Through Solvent Treatment, Polymer, 45: 8443–8450 (2004). Nardes A.M., Kemerink M., de Kok M.M., Vinken E., Maturova K., Janssen R.A., Conductivity, work Function, and Environmental Stability of Pedot:pss Thin FIlms Treated with Sorbitol, Organic Electronics, 9:727–734 (2008). Martin B.D., Nikolov N., Pollack S.K, Saprigin A., Shashidhar R., Zhang F., Heiney P.A., Hydroxylated Secondary Dopants for Surface Resistance Enhancement in Transparent Poly(3,4-ethylenedioxythiophene)-Poly(styrenesulfonate) Thin Films, Synthetic Metals, 142: 187-193 (2004). Zhu Z., Liu C., Xu J., Jiang Q., Shi H., Liu E., Improving the Electrical Conductivity of PEDOT: PSS fFilms by Binary Secondary Doping., Electron Mater Lett., 12: 54-58 (2016). Wang X., Hu S., Li Q., Li F., Yaob K., Shic M., Study of PEDOT:PSS-SnO2 Nanocomposite Film as an Anode for Polymer Electronics, Journal of Electroceramics, 18: 161-165 (2007). Wang S.J., Park H.H., Inducting Effects of Ionic Liquid Crystal Modified-PEDOT:PSS on the Performance of Bulk Heterojunction Polymer Solar Cells, RSC Advances, 5:52874-52881 (2015). Atabaki F., Abdolmaleki A., Babaei E., Kalvandi M., Yousefi M.H., Study of Absorption Wavelength of PEDOT:PSS Synthesis Specially for Conductive Layer Used in Solar Cell, “Iran Conf. Optics Laser Eng.”, (2013). Atabaki F., Yousefi M.H., Abdolmaleki A., Kalvandi M., Poly(3,4-ethylenedioxythiophene): Poly(styrenesulfonic Acid) (PEDOT:PSS) Conductivity Enhancement through Addition of Imidazolium-Ionic Liquid Derivatives, Polymer-Plastics Technology and Engineering, 54: 1009–1016 (2015).